What a lovely weekend it has been. 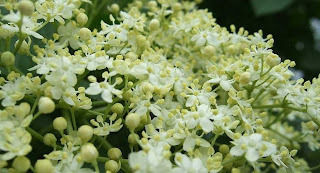 The weather has been glorious and it has been ideal for collecting the Elderflower heads I needed for Cordial. So off we went to collect them. Lily wandered around swinging the basket and counting how many flower heads I had put in. Then it was back home to make the cordial. Pick 30 good sized heads with the flowers fully open. Rinse the Elderflowers briefly in cold water to remove any bugs, shake off excess water and allow to dry on a tea towel. Boil 1.5L (2 3/4 pints) water pour into a large bowl and add the sugar stir until dissolved . Allow to cool slightly then add the Lemons, citric acid and Elderflowers. Stir and cover loosely with a tea towel. Leave to stand in a cool place for five days, stirring twice daily. Strain the liquid through a sterilised muslin cloth laid in a colander, into a large bowl. Crush half a Campden tablet and dissolve in 2tbsp of water, stir into the cordial this helps the cordial to last up to 1 year. Pour the cordial into clean, sterilised bottles, seal them with a tight-fitting cap then label. The cordial is ready to use straight away just dilute to taste with water. The aroma in the kitchen is heady with the smell of Elderflowers. I love the smell although it is usually at the end of May rather than the beginning of July. Better late than never though. This looks very intriguing. I don't think American's have anything like a cordial, but I remember reading about raspberry cordial in Anne of Green Gables. Do you dilute it to drink? What flavor does it have? Is it "flowery" or fruity? Ooh, sounds lovely - thanks for the recipe... and not a trace of apple ;-) Oops! Thanks again for coming all this way on Sat, it was lovely to meet you. This looks wonderful. My husband and I have a small yard, but it's large enough to plant a couple of these for the future. Great minds think alike! I have been making mine too. I have also just made rhubarb cordial too, again a bit later than normal.